Symbols. Carl Jung created a theory that symbols are essential to the understanding of human nature. 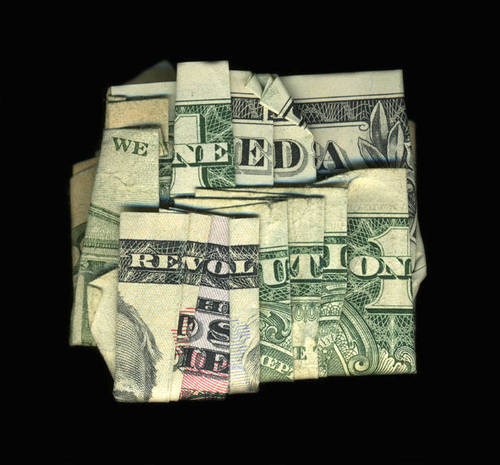 I believe that humans create symbols to foster the understanding of ourselves and connection between us all. We create symbols to stand for a belief. We weave symbolism into our literature to make it richer, to make it more meaningful, to connect us to something more than the words. We use symbols to make us feel. To make us remember. To let us feel a part of something greater than ourselves. To take the place of something so painful that our hearts can’t hold on anymore. To let go, even just a little at a time. I am not sure there is anyone that can escape the enormity of that day ten years ago and the indelible impression left on the psyche of Americans and much of the world. We all experience things differently. This tragedy was no exception. We all react to crises differently. This one was no exception. I have heard and read the accounts of so many people in the days leading up to and on the fateful day. Fate. Some believe it must be so. Fate is the reason that they did not get on the plane when they were supposed to, or met the man who was to pilot one of the planes just the day before, that they decided to stay home sick from work, or that their loved one decided to make a last-minute switch and get on a plane headed for nothing less than a horrifying tragedy. I don’t believe I will ever forget the morning when I was awoken by a phone call from my husband and told to turn on the tv. He had gone in to work, but I was working later and sleeping in. I will never forget the horror of the imagery and never so thankful that I didn’t have my own children yet to have to explain this to. I don’t think I will ever forget going into work over the Bay Bridge and seeing nearly every single building in San Francisco with a flag atop waving in a calm breeze – symbols when we needed them. It was a powerful sight. 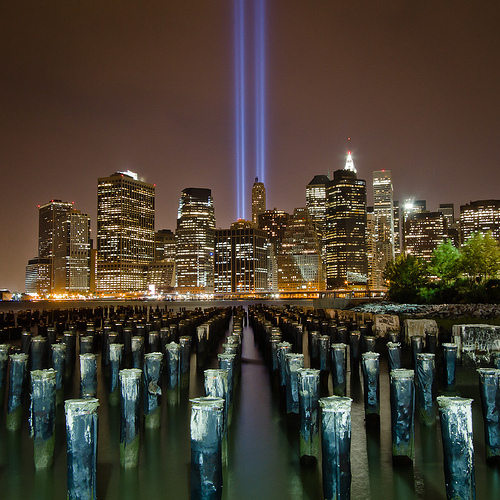 Tribute in Light has been a symbol every year since 2002 and is a powerful memorial to the people who lost their lives. I have seen the best of people over the last ten years and the worst in them too. I have seen clashes about culture and religion and ignorance and the realization there may not be a right answer to what our country should or should not do, and certainly not a simple one. 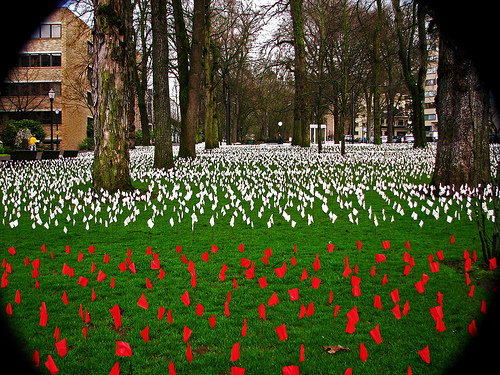 Iraq War Demonstration at Portland State University - Each red flag represents at least 5 Americans. Each white flag represents at least 5 Iraqis. Killed after the 2003 invasion in Iraq. I have seen a missed opportunity for something fundamentally stronger to emerge. I have said it more than once, and I will say it again, I do not have all the answers. No one does. But, I do know there is no better way to develop greatness than through purposeful and meaningful collaboration and thoughtfulness, yet also moving past the symbolism and into something that knows no borders, no cultural differences, no language barriers, no fear. I am tired of the politics, both here and afar. I am tired of the constant bickering between leaders of our country like they are children fighting over a ball on the playground. I am tired of people believing that it is acceptable to posture for the sake of political appearances while there are people suffering. I am tired of people believing that we ought not help those in dire need in Africa, the Middle East, or anywhere else, because we must “take care of our own first.” I am tired of fear being used as a tool of manipulation and money as a tool to explain a lack of empathy. I am tired of always seeing barriers of us versus them put out as an obstacle we must fight. I sometimes get tired of fighting. We need to stop feeling sorry for ourselves as a nation and recognize that we have it damn good and it is on the backs of those that never did. 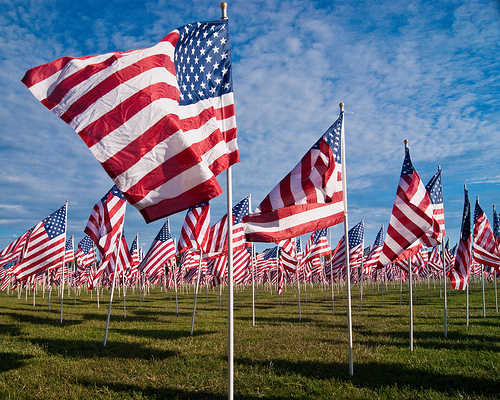 We need to be respectful and honor the memory of those who lost their lives and continue to risk them today. We need to learn from our mistakes, as a people and as individuals. We need to keep ourselves and our humanity safe and secure. We need to feel sad when we hear stories on the radio about those that were touched by that day and understand it is ok to still cry, even as you take your daughter to preschool. We need to feel. It is simple as that. Feel, then act. It has been ten years. It is time for something more. 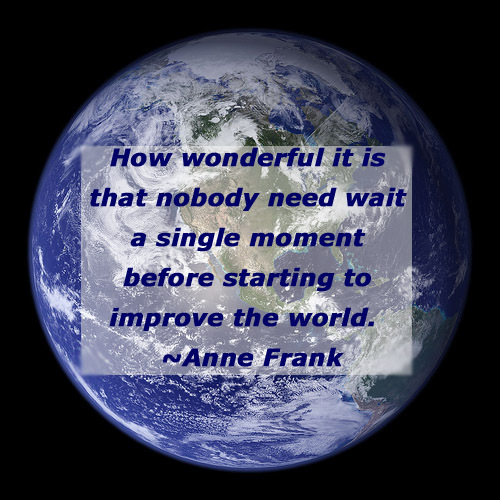 It is time to do something to make a real difference, make it a better place for our children, grandchildren, and beyond. It is up to you and me and us. No one is going to do it for us. But if we all do…. just think what can be done, for good or bad. Which will our society choose now? I thought I would write this post from the perspective of how to talk to your children about remembering the day – for the ones that remember to the ones who were just babies to the ones that weren’t even a consideration yet. Perhaps find books that would help. Right or wrong, I have decided that today is not the day I am going to tell my kids about the day the world was changed. I am not going to tell them about the horrors, then and ongoing. I am not going to take them to any memorials or listen to the radio. My oldest is only seven. He still has time to learn about the complexity of human nature that would allow for something like this to have ever happened in the first place. They all have the right to not have to worry about this just yet. What I can and will do, is teach them to be compassionate. I can show them that there is often more than one answer and to open to the possibilities. I can help them understand what it means to give something of yourself to someone else in need. I can do my best to instill empathy, thoughtfulness, understanding of right and wrong and shades of gray, tolerance, curiosity, and all those things that will make them the people who can change the world. A mama of three trying to live a green life, pursue greater health and well-being for my family and the planet, while teaching my children well so they will grow up successfully and leave me. Almost All The Truth provides tips, insight, and a little activism for those wanting to go green. Nice touching post! It sure takes us back to the day and time when this occurred, though I guess we have come along a long way now. But yes, what has it taught us is to be more compassionate and understanding. You have stated it so well in your last paragraph, as that is something we can pass on to our kids! Thank you, Harleena. I do believe that we are borrowing from our children’s future and it is our responsibility to ensure the best future for the next generation(s) as possible. Great post. I was in high school at the time of the attack and my English teacher said to us, “The only way to fight terrorism is through education.” So true and symbols are such powerful teaching tools. Happy Birthday to the most perfect first baby (bear) ever!